Mexico was in a terrible mental state at the end of the CONCACAF WCQ in 2013. They landed in 4th place, sending them to a playoff with New Zealand. This was something no one forecasted the year prior, but after melt downs in the Confederations cup and WCQ under de la Torre, Mexico had seen itself close to a pure disaster. Chepo de la Torre was canned, and then Tena…and then Vucetich. The FMF felt it needed to make one last shot by hiring Piojo Herrera to a short term contract, in order to boost Mexico into the World Cup. What was a controversial move, turned out to be one of the FMF’s best moves in ages. Herrera readied a new look El Tri past New Zealand, and sent them on their way to Brazil. He would then become the full-term manager of El Tri. After Mexico’s poor WCQ, many didn’t see them advancing out of their group in the World Cup after being paired with Cameroon, Brazil and Croatia. However, Mexico began to take up a great form heading into the World Cup, and they managed to finish tied with Brazil at 7 points after three games. Mexico’s exit was too early. They were playing some of the best football in years, taking teams on with confidence. Yet, on that fateful day against Holland, Mexico was limited in the round of 16. We are now post-Brazil 2014 and Herrera continues his reign with Mexico, and for good reason. Since the end of the cup, Herrera has been to looking to the future, giving different names a chance in friendlies. He recognizes that Mexico has many challenges ahead with the Copa América (2015, 2016), Gold Cup, Olympics and possible Confederation cup. El Tri will have the opportunity to showcase its talent on some major stages, and the sour taste leftover from the WCQ can finally be put to rest. Mexico’s football under Piojo will only continue to improve, as Herrera understands that different players need to get exposure, players need to continue to look at landing with clubs abroad and even trying out different formations. Fans across the world can finally feel confident with a team under Piojo’s control, because his only goal is to see the Mexico team evolve. El Tri did fall in its last game of the 2014 year, but many fans and pundits understand that Piojo made major changes from El Tri’s triumph over Holland, 3-2. It may not have ended as fans wanted, but Herrera made those changes to see who is ready for the big stage, and what tactical changes are not going to work. Yet, despite the loss against Belarus, Mexico walked away with positive vibes as the team gelled excellently against the Netherlands…and the return of Vela was nothing short of spectacular. The win gives us a glimpse of what Mexico can be in the near future. The golden generation is growing, and with Herrera at the wheel, we may see one of the best Mexico teams in our lifetime heading up to Russia 2018. Miguel Herrera spoke recently about the future of the national team, claiming that there are no closed doors. Even mentioned Vela and Jona dos Santos by name, saying he would like to see them play in November with El Tri. Raúl Jiménez made his transfer to Atlético Madrid and played 12 minutes against Real Madrid on Tuesday. Javier Aquino got off to a good start with Rayo Vallecano, scoring in his first apperance. Hector Herrera continues to shine with FC Porto. He scored the winning goal in their Champions league playoff against Lille. Héctor Moreno was successfully operated on for a fractured bone in his leg. He will miss 5-6 months. Several teams are showing massive interest in Memo Ochoa, Liverpool and Arsenal being two of them. The FMF says that Mexico could have two friendlies later this year in the USA. Also, there could be an attempt to make a European tour in the near future. El Tri will be officially ranked 10th in World Cup standings, only to be beaten by Chile by one spot at #9. Ulises Dávila will be playing in 1st division Spanish football soon, thanks to his game tying goal for Córdoba CF which promoted them to the Primera Division in La Liga. The process to the 2014 World Cup was rocky for Mexico, and many believed that Mexico’s reign in the CONCACAF was all but over. This lead to several coaching changes, until Miguel Herrera was signed for the World Cup playoff against New Zealand. From then on, Mexico began to build up confidence as a team. However, many still believed that the group Mexico was in for the World Cup was just too powerful for this once shattered group of players. Cameroon had a deadly counter, and Mexico had struggled with South Africa in 2010. Brazil, the obvious, was the host and nearly unbeatable at home. Lastly, Croatia was a young European team with an XI filled with European club stars. Mexico really was a question mark heading into Brazil, but they came out on June 13th, and showed that they weren’t there by accident. Herrera sent out an El Tri which knew exactly what they wanted to do. They controlled the game against Cameroon, and even when the officiating ripped Mexico off with two incorrect offside calls, Oribe Peralta put Mexico on top. The 1-0 victory over Cameroon gave Mexico the breathe of fresh air they needed, because Brazil was no push over. Mexico’s game against Brazil would be known as one of the best goalkeeping performances in a World Cup. The controversy over who would be keeper for the World Cup quickly died when Guillermo Ochoa stopped Brazil’s powerful attack. However, Mexico did not lay down for Brazil. They continued to attack, and Herrera sent in attacking subs to try to win the game, but the 0-0 draw was a shocker in group play…and Mexico was just fine with that. The final match against Croatia was the due or die match of the group. What made matters more interesting for this match was Croatia’s unusual comments about Mexico’s comments heading into the match. The claimed they were better, that Mexico’s knees would be shaking and that Ochoa isn’t the best opponent Mandzukic has faced. The words were not enough to scare off El Tri. 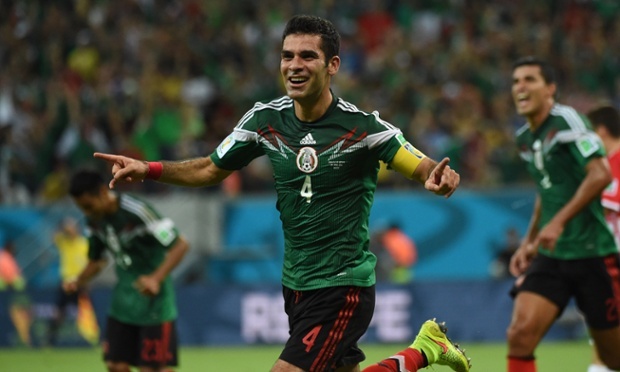 What transpired was one of Mexico’s best World Cup games in recent memory. Not just because they won, but in the fashion they won. They controlled the game, cut out attacks and showed they were the better team…and with patience, the goals arrived. Looking back at the cup, Mexico appeared to be a real unified team. In 2010, there were players who stood out, and some who faded. But in 2014, this team sang the anthem with their arms on each others shoulders, they played with passion and laid it all on the field. Mexico was not able to reach the 5th game which we all craved, but they also didn’t lose in a dismantled manner. They were never blown out, they didn’t crumble, but sometimes (major) calls don’t go your way. Looking forward, Mexico fans will see that they have a ton of talent coming up the ranks. With the obvious Chicharito, dos Santos, Ochoa, guardado etc. Vázquez hadn’t even played 5 games with Mexico, but started and didn’t disappoint. His passing percentages were mind blowing, and his absence against the Netherlands was major. Hector Herrera…where to begin? The guy had people like Rio Ferdinand talking about him. His silky ball control, vision, and pace makes him one of Mexico’s best prospects. It is a shame and a heartbreak that Mexico was eliminated in the round of 16, while being able to tie Brazil with 7 points in group play. Mexico’s talent, unfortunately, didn’t have enough luck this time around. Yet, the confidence that this team was able to achieve leaves me optimistic for what is to come next. Mexico has an excellent group stage after collecting 7 points. What came next was a monumental match up with the Netherlands in the round of 16. If Mexico had won the match, history could have been made as they would have played either Costa Rica or Greece, two good teams, but not quite the potency of Netherlands. If was a give and take first half, but Mexico seemed to be able to shake the Netherlands defense and keeper. Yet, 0-0 remained, and Mexico seemed to be poised. In the 48th minute, Giovani dos Santos got the ball outside the box and shot a missile which gave El Tri the 1-0 lead. Mexico seemed to die down in possession from that point, and Netherlands attacked with all their power. Corner after Corner became the norm, and in the 88th minute, Sneijder scored off a deflection on a corner. But…it was in the 90th minute, Márquez was called for a weak penalty against Robben. Huntelaar would convert, and Mexico was eliminated from the 2014 World Cup. Here at TriReport, we would like to say thank you for choosing us to give you up-to-date news/updates, it was a pleasure.